Recently, Govt. 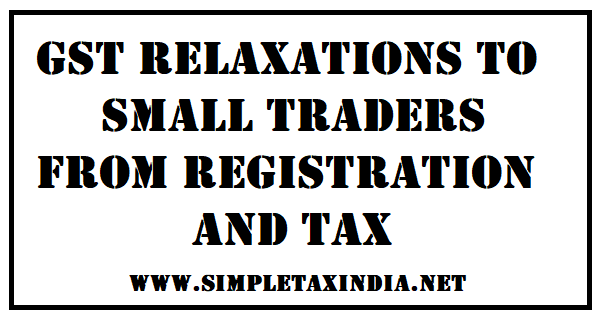 had provided some relaxations to the small taxpayers in the registration as well as on tax rate applicable on the supplies made by them. These relaxations will come into effect w.e.f. 1st April, 2019. Persons engaged in making the intra-state supply in the specified states*. Persons engaged in making supply of Ice cream & other edible ice, whether or not containing cocoa; Pan masala and Tobacco & manufactured tobacco substitutes. First supplies of goods or services or both up to an aggregate turnover of Rs. 50 Lakh. 1) If person had taken more than 1 registration under the same PAN, then CGST on all supplies made by that person is paid at 3%. 2) Person shall not collect any tax from the recipient nor he shall claim any ITC. shall include the supply from 1st day of April of FY to the date from which he becomes liable for registration. shall not include the supply from 1st day of April of FY to the date from which he becomes liable for registration. 6) Person who avail option of paying tax @ 3% as mentioned in this notification, he shall pay tax @ 3% on all outward supplies overruling any other notification issued u/s 9(1) or 11. 7) Not applicable on inward supplies as mentioned in section 9(3) or 9(4) i.e. Person shall be liable to pay tax on such supplies at applicable rate.